1930. Loudspeaker. Ait Chrome. Model U99. Exhibit at Amberley Working Museum. 1935. Model 66 4-valve. Exhibit at Amberley Working Museum. 1936. Model 48. Exhibit at Amberley Working Museum. of Western Avenue, Acton, London, W3; and North Devon. Export Department: 62 Buckingham Gate, London, SW1. Telephone: Victoria 1686. Cables: "Radwaves, Telex, London"
1920 Edward E. Rosen set up Edward E. Rosen and Co, making wide-frequency-response headphones, with a new factory in Devonshire Square, London EC2. 1921 The success of the headphones meant a larger premises was needed and a new factory at 158-160 City Road, London, EC, was taken on. Started to produce horn loudspeakers. 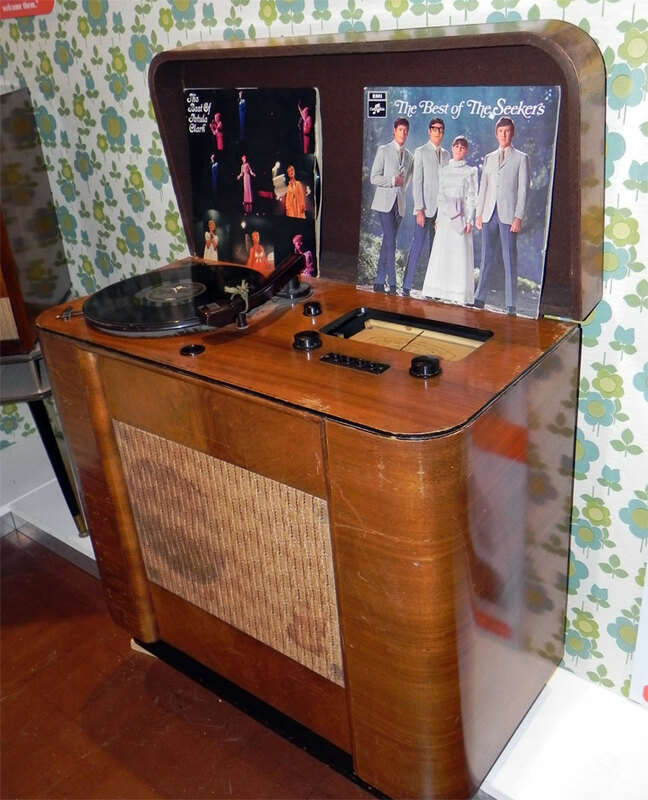 This was a lucrative move as both shop-bought and home-built receivers needed horn loudspeakers to work. 1923 The firm expanded again into new factory (6,500 sq. ft.) at Harrow Road, London, and employed 20 people initially. Started to build the philosophy of in-house vertical integration by manufacturing components from raw materials. 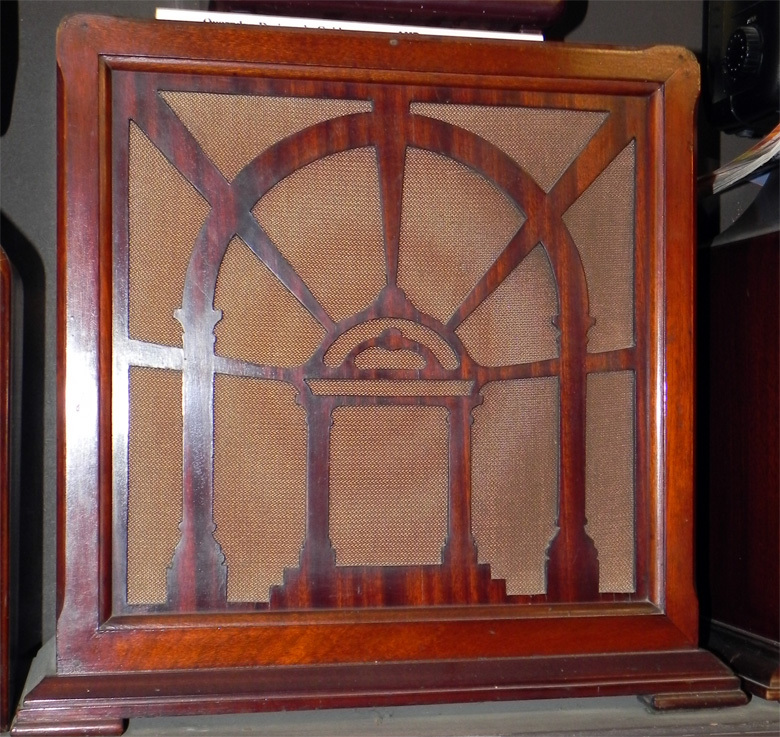 1924 Marketed the Beco (British Electric Manufacturing Co) magnetic-reed type moving iron loudspeaker, the first British commercial moving iron loudspeaker. Named the Ultra. 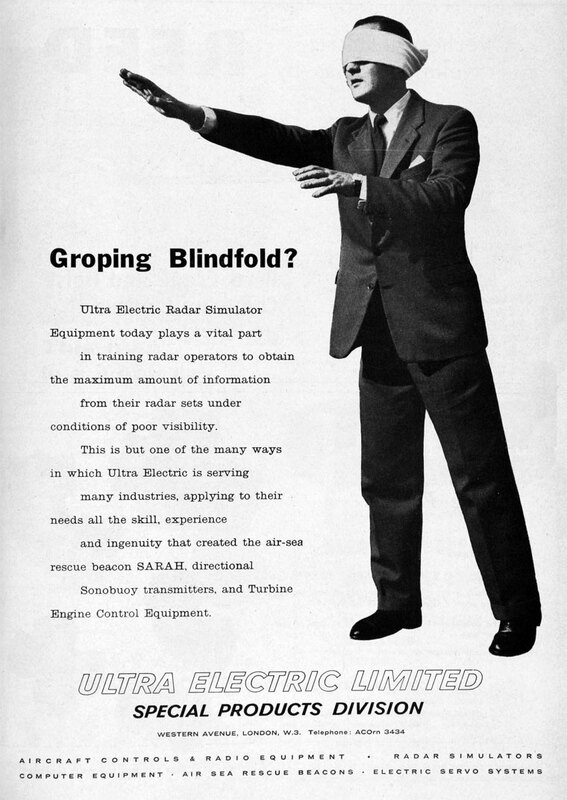 1925 Ultra Electric Ltd was formed. Edward also changed his surname to Rose to try and disassociate himself from his background, though the wireless world continued to use his original, familiar one. Products ranged from loudspeakers, pickups, battery eliminators and a portable receiver. 1928 Ceased the production of horn-type loudspeakers and started with the "Air-chrome" moving iron (double doped tensioned linen) speaker. 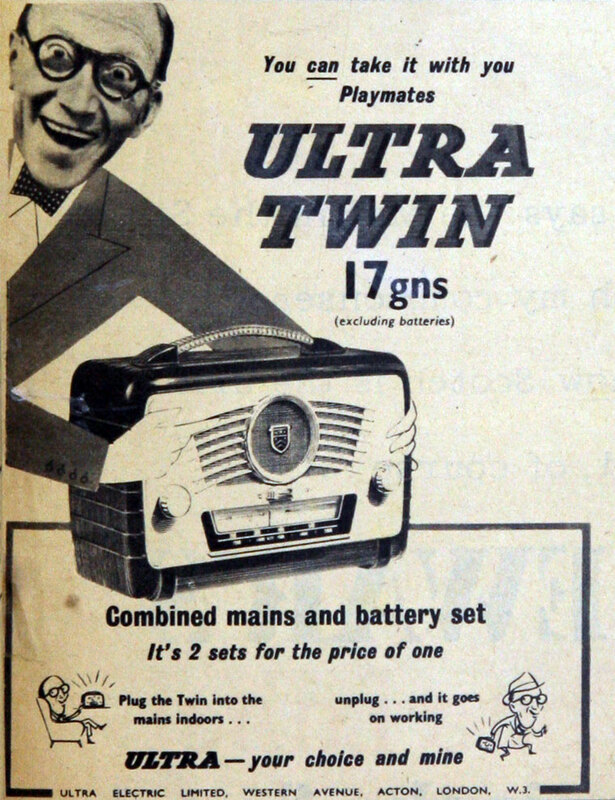 1929 Ultra recruited E. H. Munnion from Marconiphone when it was taken over by HMV (see also Gramophone Co) as the new radio designer, to aim for the middle of the road market. 1930 Harrow Road premises was by now 24,000 sq. ft. with a work-force of some 250 people. 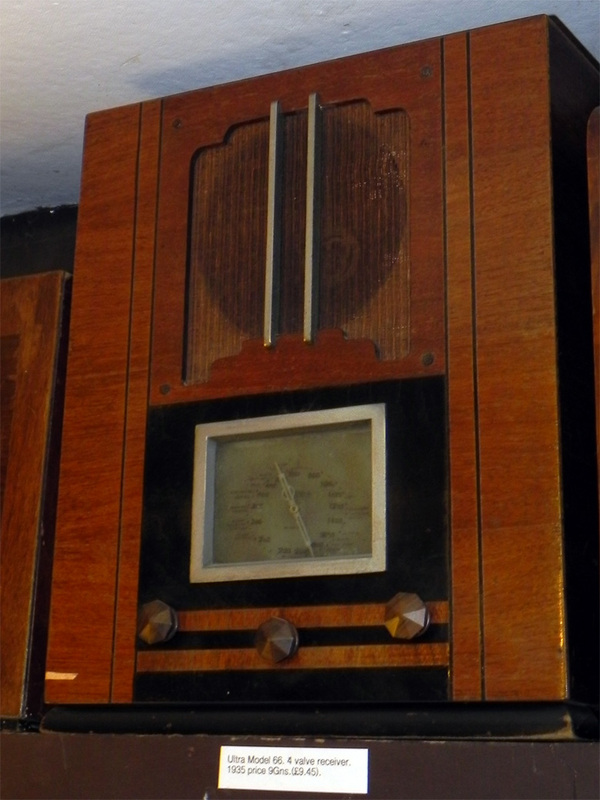 1931 First mains receiver produced. 1932 Move to a new factory at Erskine Road, Chalk Farm, London, NW3, which housed 600 employees. Vertical integration continued to the point where 95% of the components were made in-house. 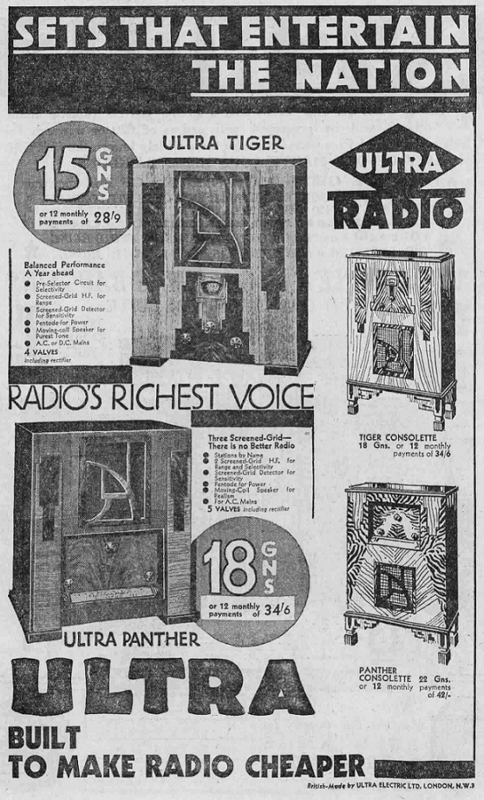 Issued exotic named radios called "Tiger", "Panther" and "Blue Fox". A Drawing Office was set up although cabinet design was outsourced. 1935 Moved to bigger new premises and head Office in Western Avenue, Acton, London, W3, which was 150,000 sq. ft. The factory had an output capacity of 1,000 sets per day with 1,500 employees. 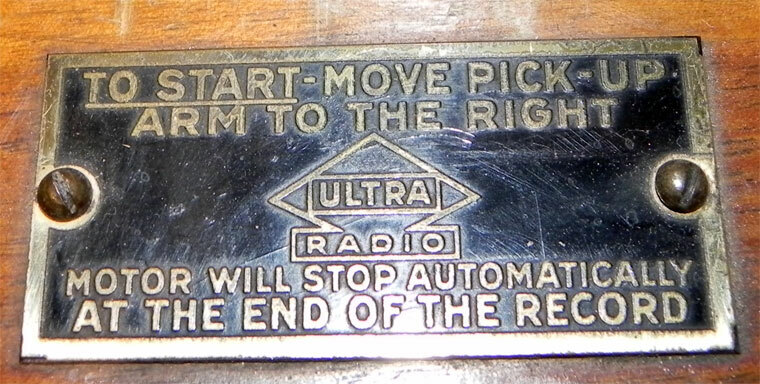 WWII Ultra turned production over to equipment for the war effort, but also made the Civilian "Utility set", U10. 1947 The first year after the war that Radiolympia was held. 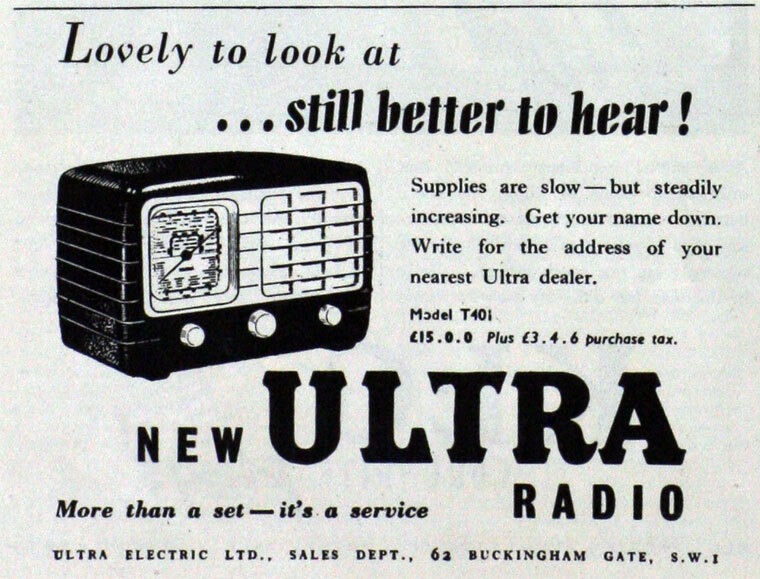 Whilst Ultra retained its interest in military supply it was determined to re-enter the consumer business. 1947 New Sales Office at 62 Buckingham Gate, London SW1. Tel Victoria 1686. 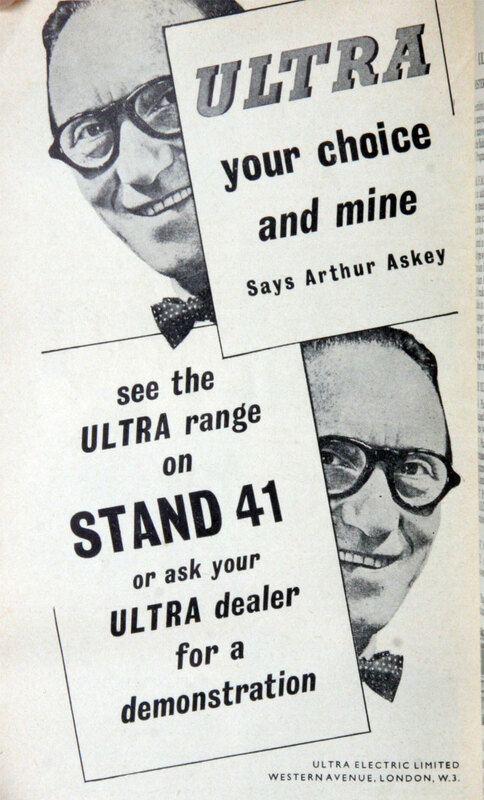 1956 Ultra used Arthur Askey in new advert series and in store promotions posters. 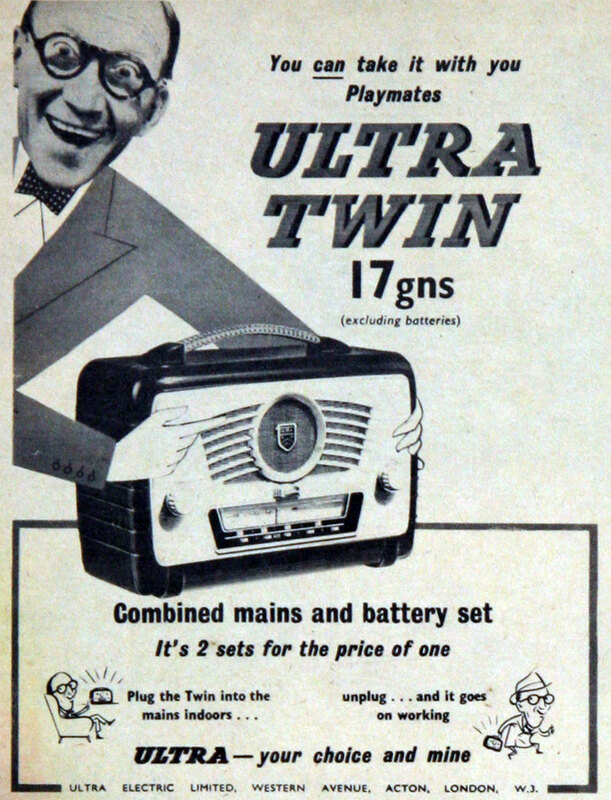 It was still a novelty for advertisers in the radio industry to use celebrities to endorse their product. New Scottish Depot and Service at 40 Wellington Street, Glasgow, C.2. October saw the inauguration of their new radio and television factory on the Fareham-Gosport road on the outskirts of Gosport town. The factory was equipped with the most modern plant for the production of domestic radio and television receivers under the best possible working conditions. The whole of the company's domestic receiver production was centralized at Gosport, thus freeing the Ultra factory at Western Avenue for the production of special products. By 1958, cost cuts were needed at the inefficient Gosport factory. Whilst the Special Products Division was doing well, the consumer products were not. 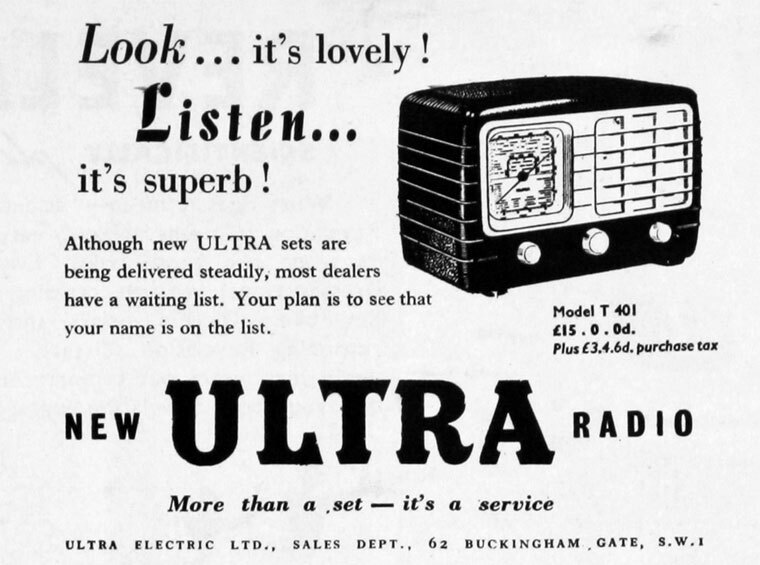 1959 In order to expand their business, Ultra decided to purchase Pilot Radio, which then became a wholly owned subsidiary of Ultra Electric Ltd. Ultra also acquired the Pilot trade marks in 17 European countries from the Pilot Radio Corporation of USA. (Pilot Radio Ltd, a private company with works at Park Royal, Middlesex, was founded in 1935 and had association with the Pilot Radio Corporation of USA, with whom it maintained close ties). In November there was a new Ultra sales address at Stonefield Way, South Ruislip, Middlesex. 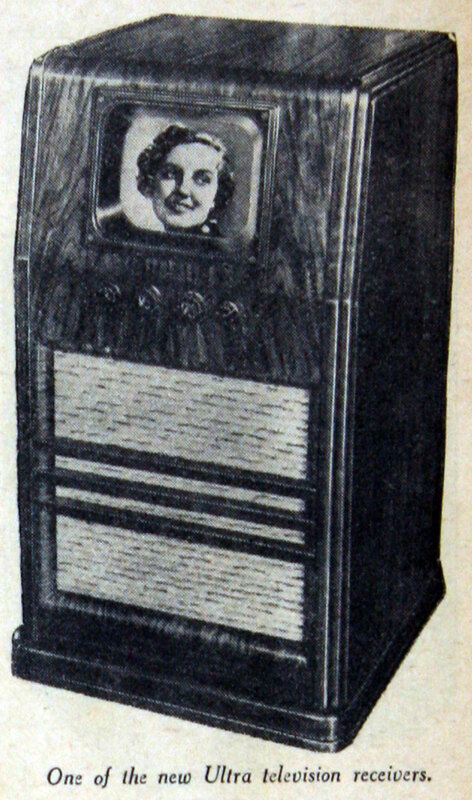 1960 Rosen split the electronics and receivers divisions into two companies. 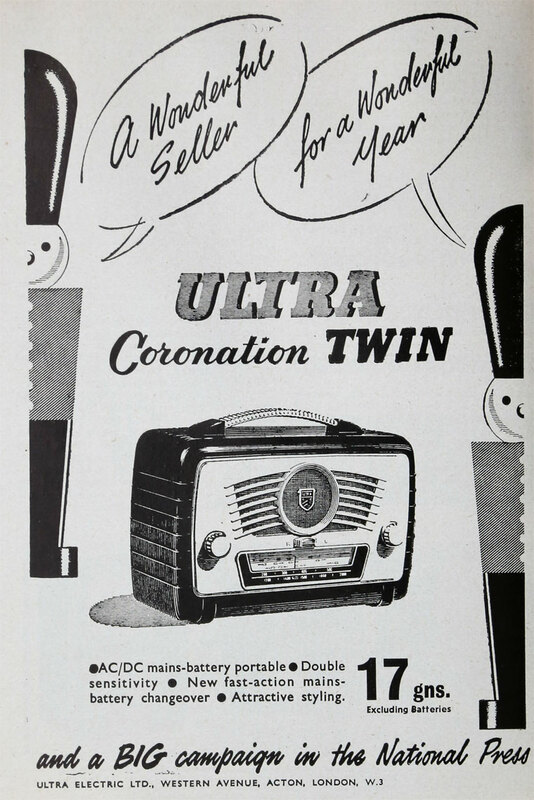 1961 The over expansion, purchase of Pilot and a slump in consumer sales meant that a rights issue, then a sale (in April) of 40% of the new electronics company was needed to generate £2 million. In May, the radio and television company (including Pilot) was bought by Thorn for £2.4 million. The group would concentrate on electronics, as Ultra Electronics. Rosen retired shortly afterwards. 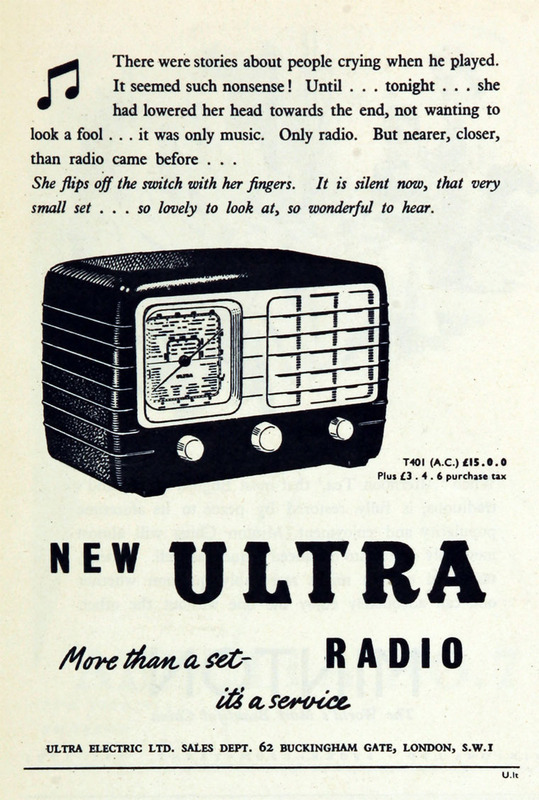 1962 Ultra Radio and TV Ltd. introduced a new range of receivers called the "Smart Set". 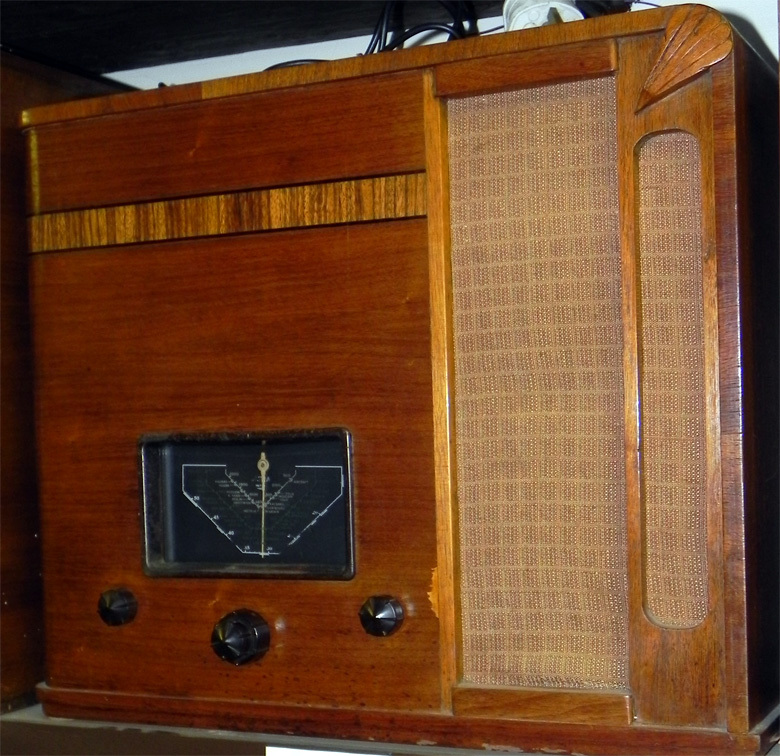 The range comprised three 19" TV, two radiograms, four transistor sets (one a VHF table model) and a mains operated record reproducer. The company's Bermuda trade mark was retained; all sets were fully convertible to 625 lines. 1974 Thorn dropped the Ultra brand name as the consolidated (but brand name-heavy) industry fought against the very strong Japanese imports. This page was last edited on 4 June 2015, at 16:58.